Being a relatively new family, we are always looking for new, fun, & hassle free traditions to start. When you come together with your husband in marriage you both bring different family traditions, which can be fun unless they clash/take place the same day & then you have to either meet in the middle or form completely different ones. I got pretty lucky because both my husband and I have very few traditions even during the Christmas season. Which means, we pretty much have free reign to start whatever tradition we feel like! 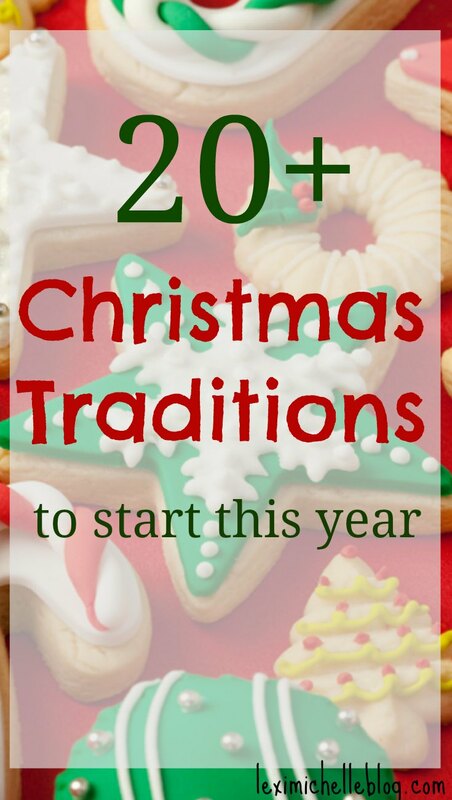 I have been researching and found/thought up these Christmas traditions that seem fun and are also hassle free! 25 days of Christmas book-a-thon. Read a different Christmas book every night before bed starting December first. Drive around & look at Christmas lights. Google to find out if your city puts on a light show, & definitely go to that! They are so fun to see! Early Christmas brunch with grandparents. This is from my family. We always celebrated Christmas early with my grandma. It was nice because then on Christmas day we were able to just lounge around all day in our PJ's. I love a good lazy day! Snowy Chocolate Pine cones. We're not big gingerbread fans, so these pine cones are a fun alternative. Advent Calendar with thankfuls. We always did the typical chocolate a day advent calendar, but wouldn't it be nice if to get a candy you had to do more than just wait a day? We are all about expressing gratitude this year, so we are saying one new thing we are thankful for each day til Christmas. Go out to eat! We like to make whole day of it. And quite frankly, after spending a couple hours picking out, setting up, and decorating a tree I am not in the mood to cook a gourmet meal as well. We either do Chinese take out, or a Japanese style Tepanyaki restaurant. I couldn't tell you why-- it's just tradition! Listen to Christmas music while decorating. Pre-make dough for Christmas morning sweet rolls. This really doesn't take long, I typically do this while everyone watches a Christmas movie. Takes like a half hour max. Make cookies for Santa. We are trying a new cut out cookie recipe this year. I will link it here the 2nd week in December if it's a success. Put sweet rolls and a breakfast casserole in oven so it can cook while everyone opens presents, then enjoy a delicious (no fuss) Christmas morning feast! Make a special dinner. We like to do Mexican food. For special occasions I will either make carnitas or chicken empanadas. Let me know some of your favorite family traditions below!